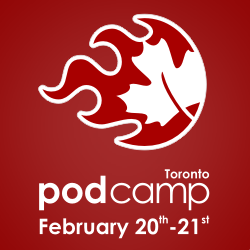 I enjoyed a great Saturday mingling with and learning from the smart and interesting group of people at PodCamp Toronto. PodCamp Toronto 2010 is a free unconference bringing together professionals and hobbyists to explore the cutting edge of new and social media. The MakerCulture DIY experiment with open journalism is an intriguing project creating content and community through collaboration and dialogue. Wayne MacPhail, who presented with Western student Curtis File, feels that traditional news media aren’t capable of open journalism. Agreed, old media gatekeepers are still figuring out social media and the blurry line separating authors and audience. Dave mentioned that Molson is doing a good job with the social media marketing ecosystem. Why? Molson has invested three years into SM, generates good content, responds well to feedback and senior leadership gets it. Partial proof of success: paid media, earned media and owned media all support each other and deliver results such as thousands of community followers and loads of earned media coverage. The hit of the day for me was The Social Web, Crisis, Response and Reputation Rejuvenation in the Automotive Industry delivered by GM’s Chris Barger. He shared the trials, tribulations and successes of the beleaguered car company’s ongoing SM program to manage last year’s bankruptcy filing. Highlights included the 25 to 75 ratio of talking to listening, respectively; community comes first; demonstrate change; small gestures will resonate; let advocates advocate; embrace key influencers; and reputation rejuvenation needs to be sustained. It’s always interesting hearing case studies about crisis management; Chris’ candid insights added to the compelling content. Thanks to all the PodCamp organizers and sponsors for assembling a strong group of presenters. It’s always fun connecting with smart, talented people. As I read the letters to the editor in the Globe and Mail this morning I’m reminded of how social media has super-sized our ability to respond to what we see and hear in the media. The letters are poignant and insightful and offer a variety of opinions regarding Richard Colvin, the diplomat who exposed the alleged Canadian torture of Afghanis and regarding Peter MacKay, Canada’s Federal Minister of Defense. Before SM, only a handful of the public’s voice would be heard in response to the news of the day. Now, so many other smart points of view can be shared and further discussed. SM also offers the opportunity for the Globe and Mail, Canada’s Federal Government, Richard Colvin and anyone interested to check the content of what people are saying about this issue in Canada and around the world. In this way we can all decide for ourselves which direction public opinion is flowing and if Colvin is righteous and/or if MacKay is right to attack the credibility of this whistleblower. The Canadian Council of Public Relations Firms, of which Porter Novelli is a member, is hosting an invitation-only event on June 23: The Changing PR Landscape. The Canadian Council of PR Firms is a national organization of leading public relations consulting firms operating in Canada. The CCPRF is dedicated to promoting the role of public relations in business strategy and organizational performance. Given all the discussion about the rise of social media, the death of newspapers and decline of traditional media, the death of advertising and the rise of PR which has now been replaced by the death of PR as we know it, you can imagine some of the things we’ve talked about at our Council meetings. I’m fortunate enough to join them on stage as the moderator which will give me the opportunity to facilitate the discussion that will ideally generate insights about the current and future state of the PR industry. As I prep for the event I’ve assembled questions from CCPRF members and my colleagues. To this end, I’d be interested in your questions and points of view which I’ll use if I can at the event.